I am joining in for the first Five Minute Friday of 2017! I’m excited to get started writing more consistently this year (and hopefully building my blog into something “more” as well) and Five Minute Friday is always a great exercise with a wonderful community along for the ride. This week’s prompt is “Connect”. Well. I am finding it somewhat difficult to connect to the prompt connect. I’m just not sure where to go with it. A lot comes to mind. Connecting with others. Making connections in my life. Connecting the dots. But, none of it is really driving me to write about it. So, I guess I’ll write about how sometimes, it is difficult to connect with other people and things and that it is okay for that to be the case. We would not appreciate the times when connections were strong and meaningful if those types of connections were constant and consistent. I often have problems making close friends for example. I just don’t connect with others as much as I would like. And it isn’t for lack of trying. But, when I do find someone I connect with, I feel it strongly and that connection is there whether we are spending a lot of time together or just a few minutes here and there. I feel the same about entertainment and activities. I don’t often feel strong connections with TV shows or movies or exercise programs. Others seem to find something and really connect with it and loooooove it. But, I don’t as often. I connect with things from my past more than anything else. Perhaps that is where I have my strongest connections – to my past. That’s it. I feel that this week was tough. I’m not sure why. It has been a long and somewhat stressful day (although I didn’t do much). My DD is not feeling well. And although she isn’t feeling horrible either, she did start running a fever tonight and with her past, I seem to be in a bit of a PTSD anxiety attack. It isn’t horrible either. I’m not panicked or anything, but I do feel a bit of trepidation about planning and what is going to happen. In all reality, she will probably get better in a couple of days, without any complications. We went to the pediatrician today and her lungs sounded good, she had nothing in her ears, her throat didn’t look too bad and she was negative for strep. So, all good signs, but then she spikes a fever. It just makes me wonder what is going on in that little body of hers. And, in reality, it is probably nothing but a normal 7 year old virus that is running its course. But, in a heart transplant recipient, it doesn’t ever seem like a virus or illness is normal or can just simply run its course without some concern. 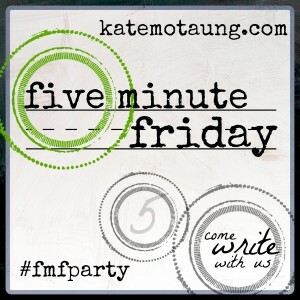 I am joining the Five Minute Friday crew over at Kate Montaung’s blog Heading Home again this week. I hope you’ll consider joining them as well. It is a wonderful group of supportive writers sharing their perspective on a prompt each week. That is my daughter. The picture is from July 3, 2009, four days before her transplant. She had not opened her eyes or been awake for days, maybe weeks before that. She had been on a paralytic in order to keep her from fighting the ventilator and all the other lines she had going into her little, tiny body. She had just been moved from the PICU to the CVICU because the PICU doctor had basically given up on keeping her stable after days of changing medication levels, plunging blood pressures to elevated blood pressures, bad labs, etc. The CVICU is typically reserved for those who have already had heart surgery, but they moved her there, I think believing that if she didn’t get a new heart within a few days, she would need to have a Berlin Heart. Either way, she would be in the CVICU soon enough anyways. She was probably as close to death as a baby can be without passing away. It was terrifying and exhausting and depressing. But, she held on. Day after day. Through what had to be painful and frightening situations. I must admit that I sometimes wondered if we were doing the right thing. Putting her through all that. But I had to believe that keeping her alive was better than the alternative. This photo was taken one month after her transplant. The difference is pretty amazing. In four weeks she was off the ventilator, smiling, had lost the puffiness that had been there for months before. She was taking formula from a bottle. She held fingers and loved to watch a mobile over her head. She was ALIVE – not just at the basic level she had been before, but at the WHOLE level. She was aware, awake and active. I am now confident that we did the right thing putting her through everything. She has thrived in the past seven years. We have had our medical bumps and rough spots, but overall we’ve had it good. We’ve had great times and we have wonderful memories and wonderful friends and being alive is good. It is important to remind ourselves of that when things get rough. Babies even know it. But sometimes life’s hard hits can make us forget that knowledge. In this season of new life, remember that being alive is a gift. A gift to us and a gift to others. Surprise! Usually it is something we think of as enjoyable. But, there are also those unwelcome surprises. And that is what we got this week. We went to the hospital as planned, after two enjoyable days in Monterey, expecting a pre-op appointment for my DD’s pacemaker placement. When we arrived, the woman at the desk asked if I had received the message the day before and when I checked my phone, there it was. A voicemail from our transplant doctor saying there had been a change in plans and to call him. I had not received it because we were at the aquarium, then my phone died from all the picture taking and I didn’t check my voicemail that evening. So, there we were, at an appointment that no longer existed. Surprise! They called the transplant doctor and he came to speak with us. It seems that my DD has only one access point for doing biopsies (I knew this before, but had forgotten) and the pacemaker team had not been told that. Surprise! So, their plan was to put the wires through the only access point she has for biopsies. Not a great plan. So, they cancelled the planned procedure and scheduled a different procedure. This one will require an actual incision in her chest again. Surprise! Hopefully, it will be done without actually opening her sternum again (requiring an unwiring and rewiring) and just going in under the sternum and running the wire between her rib bones. They will look at that to make sure that is what they can do. She will also have another incision where the battery pack will sit – a “pocket” in her abdomen. Hopefully there will be no chest tube (again, not sure about that) and there will be a night in the CVICU and then to the step down floor for three to six days depending on how she does. My usual reaction is to say to plan for three additional days because she can be a tough patient in recovery, or at least has been in the past. Hopefully she has outgrown it, and I will get a good “surprise”. But, we shall see. So, that was our “surprise” this week – one night in the hospital has turned into four to seven and we’ve postponed it until the end of April to allow for our work schedules to be a little more forgiving. But, not all surprises are good, but they are all…well, surprising! Join us for Five Minute Friday this week – link at the top! Spring Break spent fixing broken heart. No…not THAT kind of broken heart. My DD is having her pacemaker placed this week. Her sinus node is not working properly, so she is getting a pacemaker to make sure that if it decides to quit completely, there is something there to pick up the pieces and make the heart beat. We will really only be in the hospital for one night, but we have to be there the day before for pre-op appointments, then the day of, then an overnight stay afterwards, then hopefully home with pain meds and a sling on her left arm. I am not THAT concerned about the pacemaker placement. It seems relatively routine (although I question how routine anything is when you’re working on a seven year old with a transplanted heart and a valve that isn’t working properly). I am more concerned about what she is going to be like afterwards. She is slightly unpredictable when it comes to these things. Sometimes, she is a real trooper and an excellent patient. Other times, she is pretty whiny and overly dramatic and holds on to things for a long time. So, we’ll see which DD comes home from the hospital with us this time. Well, I’ve missed another few days. Everday blogging is not an easy venture! It seems like it would be easy, but it really isn’t. I’m going to try to make this quick so I get it posted as every time I leave a post partially written, I never get back to it, so I now have a bunch of drafts…so, completion is the goal! Today, I am thankful for the news we got yesterday that, for now anyways, there are no heart surgeries in our future. Although my DD’s tricuspid valve is still leaking and her heart is getting larger because of it, the pressures are good. And since she doesn’t yet have any symptoms from her bradycardia issues, the team of doctors they brought together to discuss her case last week has decided that there is not a need currently for a pacemaker or a valve replacement. So, for now, we are simply holding steady and hoping that she doesn’t have any symptoms for a long time to come. I didn’t really know how heavily the thought of that was weighing on me until we got the news that they would NOT be doing any surgeries. I realized that I have been stressed for weeks about the possibility of another open heart surgery with the hospital stay and the long recovery and the emotional toll that it takes on us. Obviously, it will come at some point in the future, but I just wasn’t quite ready for it now. So, I am thankful for the delay. I hope that her heart continues to work “good enough” for years, but I will begin to prepare myself for the alternative should it come sooner. I’m going to combine a couple of things in today’s post. Six Word Saturday AND If We Were Having Coffee! It is a meme mashup of sorts. 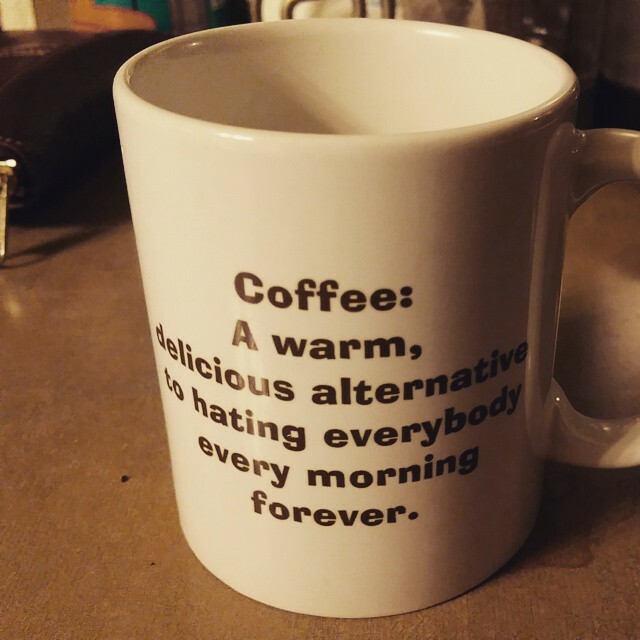 Thanks to Nerd in the Brain for reminding me of “If We Were Having Coffee” which I’ve done a few times here on the blog – here and here specifically. It is the perfect amount of randomness and provides an excuse for a totally conversational post! So, first, let’s get the Six Words out of the way. Enough already with medical issues, please! If we were having coffee, I would apologize for my house looking like we are in the middle of a move for no good reason. There are pictures from the walls sitting on the floor against the wall, waiting for me to decide where I should put them (I got some from my mom’s house and was going to switch things around, but now I’m not so sure and I’m feeling a little stuck). There are piles on the dining room table. A combo of stuff that came home from the hospital with us, stuff from my purse and stuff that was there before. Yeah – the hospital. We spent three days in the hospital with my DD this past week. Totally unexpected. We went in for a normal transplant check up and they noticed her heartbeat was slower than it normally is – only a slight difference, but they are thorough, to be sure. So, they ran an EKG and there was a pretty significant bradycardia. So, they checked her in and then they decided to be sure there was no rejection, they needed to do a biopsy. She used to have biopsies all. the. time. First, every three months. Then every six months. And we stayed at every six months for a long time. Then they bumped her tricuspid valve and it got knocked loose (it is a known issue in little ones doing catheterizations) and they had to repair it and the repair didn’t really work – just lessened it enough that when on lasix she would not fill up with fluid in her chest (which happened without us knowing once before the valve repair – again, unexpected stay, but that one was six days). Then, to keep from having to risk bumping the repaired valve, we moved to annual biopsies. But, now we’re back to six months to make sure there isn’t any significant damage to the coronary arteries and such while we figure out what is causing this electro-conducting problem. The biopsy came back negative for rejection and everything looked the same that it did in May and the lower conductors in the heart seem to be working okay, so it is just her sinus node that is deciding to misfire…or not fire at all sometimes. So, she is now wearing a heart monitor stuck to her chest for 14 days to track her heart beat over longer periods of time and we’ll see how she does. They say she is not symptomatic but I think that maybe she has had some symptoms and we just didn’t know what to be looking for when it was happening. So, now we know. And we’ll see what shows up. So, there’s that. But at least we’re home. I would tell you that my husband had to leave the next morning after we arrived at home because his mom had to have a double mastectomy and reconstructive surgery on Thursday while we were still in the hospital at Stanford. Yeah…that’s right. We were calling his dad in the hospital there while we were sitting in a hospital room here. Sigh… Good news was there was no sign of spread, so she will not need any chemo or radiation and hopefully this will be the end of it for life. Bad news, she is not being a very patient patient and my husband and his dad are totally exhausted (this is day five in a hospital room for my husband…different room, same you know what). He is going to stay down there to help out his dad this week, so I’ll be dealing with Bean on my own. I’m hoping that all goes well and there are no illnesses or heart issues or issues with his mom. I’m hoping we have no more hospital stays for anyone in our family for a long, long time. I would then drink some coffee and knock on wood and kiss my blarney stone or whatever you do for good luck and I would hope that you didn’t think I was some crazy woman with a Lifetime Movie Network life that is way to overwhelming. Because honestly, that is probably what I would think if I heard my story. I would ask you how you were doing and hope that your answer would be more Comedy Central than Lifetime Movie Network. 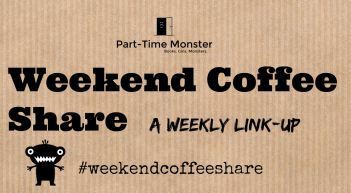 And you can include your response over at the Weekend Coffee Share at Part-Time Monster! I’m back after some time away (which will be explained in today’s Five Minute Friday post) and ready to spend five minutes writing. Things are constantly changing, but they are also always staying the same in many ways. This past few days we revisited a place where we have spent a lot of time and although we’ve changed dramatically, that place remains mostly the same. That place is the Children’s Hospital where my daughter had her transplant. We haven’t been there overnight for over three years, but a hospital room and hospital life is nothing if not the “same”. I’m happy to say we are back home, but realistically looking forward to additional stays some time in the future. We have friends who were there with us when my DD got her transplant and they are back for an entire YEAR – not IN the hospital, but staying at RMH and often in-patient for a few days at a time for cancer treatments. I guess, in some ways, that sameness is a sense of comfort. The fact that I knew where to go to get sheets and blankets and extra pillows and how to order food for my DD and where to go get food when the Children’s Hospital cafeteria was closed one night and to expect nurses in and out of the room throughout the night to do vitals is all a source of comfort where others would have a lot of anxiety. So, in that way, the fact that the hospital is the same is comforting. And I’m thankful for that. But, it is also frustrating to get woke up every day at 6:30 a.m. to get weighed (really? they can’t do a weight AFTER shift change in the morning?) and to always have the same menu to look at for food (but, at least it isn’t just some random meal dropped off to you that your kid will never eat, so that part is good). Always the same beeping of the machines (although thankful we didn’t have to deal with any IV poles or IV fluids this time). Always the same “hurry up and wait” for news or tests or results. The hospital is much the same despite the new curtains in the rooms and the new little carts to tote kids around the hospital. And for that, I am pretty thankful. Being in the hospital is stressful enough, no need to figure out “new” things while dealing with that. That’s it. Join us over at Kate Montaug for this week’s Five Minute write. More on the hospital front in a coming blog post.